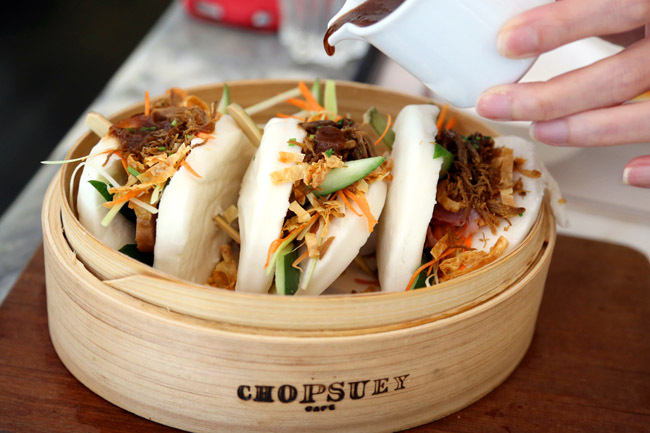 Chopsuey Café at Dempsey is PS Café’s first foray into Asian cuisine, inspired by memories of Westernized Chinese food of the owners. 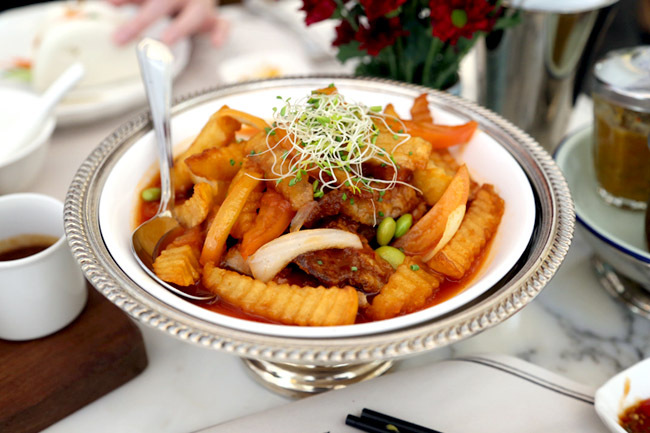 While ‘chop suey’, a mixed meat-vegetable dish itself isn’t the most glamorous of food, it is something familiar with Chinese staying overseas. I only came here because my foodie friend heard so many less than favourable things about ChopSuey, and wanted to fulfil our curiosity (and hopefully prove the others wrong). Woke Ah Yoke commented that “the cooking ranged from bad to mediocre for the starters…” though he did praise the mains; while Six and Seven reviewed that one of the dishes “tasted no better than what I get at the economical rice store”. But it can’t be that bad right? 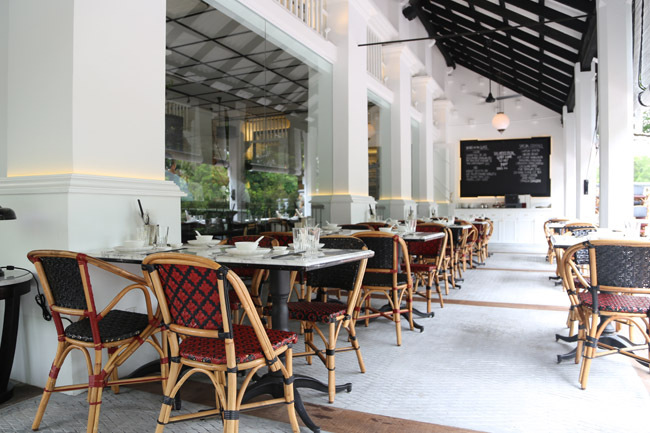 The dishes look outlandish expensive for the portions – Crispy seafood noodle for $36, crab mee goreng $26, jade fried rice for $16, and spring rolls for $22. I was mentally prepared for the price, fortunately pre-warned that the steamed rice would already cost $3. The menu left me only more confused, and I just got the very friendly and prompt waitress to recommend their signature dishes. So much for signature dishes. 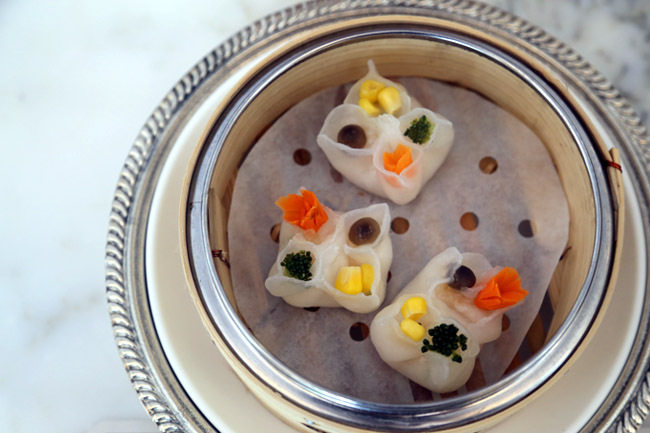 The Four Seasons Har Gao ($9) came with three miserly looking prawn dumplings (quickly worked my Maths. 1 Har Kao = $3++), though I must emphasize the whole plating looks fabulously classy. There was some disappointment where the four seasons meant the sweet corn, mushroom, broccoli and carrot toppings, which by the way did not enhance the taste at all. The skin was thick, and fillings penny-pinching. Thick skin and small fillings – it is like having the worst of both worlds. The Crispy Duck Pow Pockets ($17) again is attractively presented, looking like my favourite ‘kong bak pau’. But one wonders why they are so stingy with its fillings again, with a thinner-than-thin slice of duck, and stick-like strips of duck confit. The worst has got to be its white buns, slightly colder than warm. We would never imagine ourselves saying this, but we had better textured ones from Khong Guan. We concluded that the appetizers and dim sum are really not their forte. 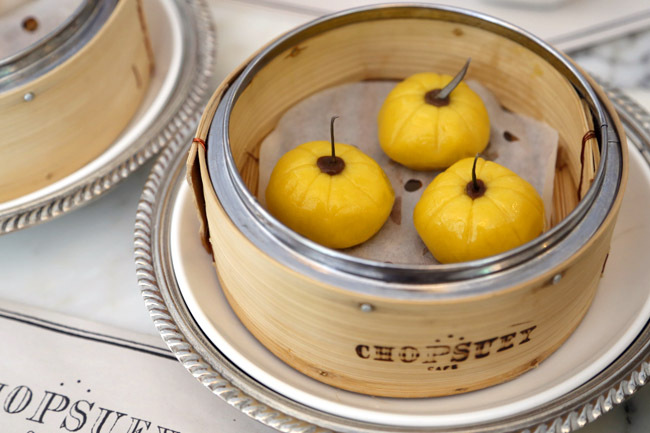 By the way, I asked the waitress for the name of the dim sum chef. She left into the kitchen looking embarrassed/frantic and never came back to serve us. Thankfully the Cooky’s Hainanese Pork Chop with Steak Chips (they meant French fries) and edamame ($24) was a saving grace. At least the pork was tender and the dish arrived warm. This concurs with what some of the other reviewers had said – that the mains are actually delicious. Perhaps the appetizer chef was having a bad day or supply, and we hope Choysuey Café’s food will see better days ahead. Still, the 3 dim sum and 1 main course set us back by 70 bucks. By the way, I heard through the grapevine that a famous plastic surgeon who spent over $500 dining there thought that “SueySuey” could have been a better name. Ouch! Bad food at exorbitant prices = KNS. bad reviews are fun to write! 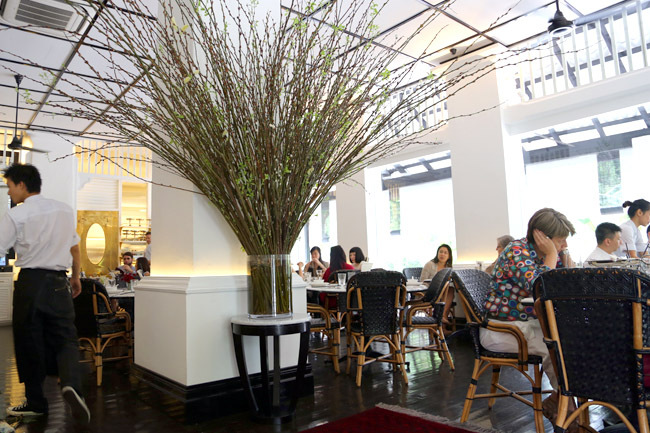 The restaurant is by PS Cafe, and you know PS Cafe lah, very pretty but so-so food. And you know I very seldom write bad reviews. So-so is one thing, but bad is another. You have to been living in states to have tasted this type of cooking and I have born and grew up in San Francisco. We have fine Asian restaurants also but certain ones that is American Chinese too. Ones that are really Asian are all customers there Asians . 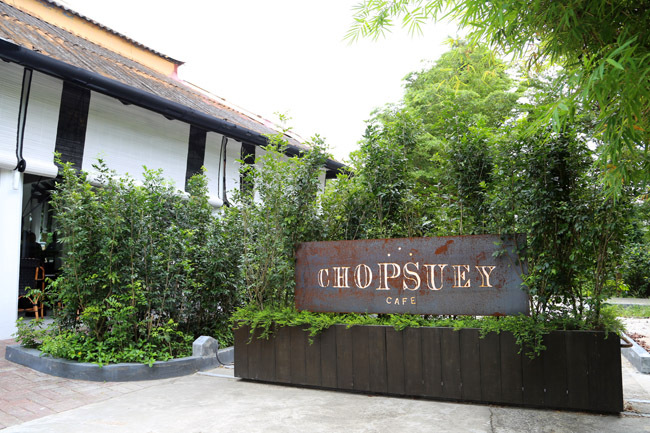 Only way to see Chopsuey Cafe is with different people who are non Asian and expats. My cousin from San Francisco now live in Singapore with his Singapore born wife. He like food so did I and my non Asian food but wife did not care much. It depend where you are from in fairness if expats ate there not bad of a place. Great new spot at Dempsey, no detail missed in the Decor. Food good, contrary to some other reviews. Will return. I try Chopsuey Cafe and find food not bad and from states also. I too feel bloggers should be more worldly in food taste to see this place different and infusion type food. Eating at Ming Tsai Blue Ginger restaurant in states and it is like Chopsuey Cafe diffeerent and infusion. Like you I will return for dim sum back when in town. People don’t bother to write properly any more. Look at the last three posts. 1) bloggers are entitled to their opinions. 2) some replies are hilarious in the sense that they are hilariously bad and nonsensical. Amy and Erica, I am utterly appalled at your command of the English language, especially when you two like to roll phrases like “I lived in the states” off your tongues. Did you use sign language, or were you using some “worldly”, “diffeerent” and “infusion” language?